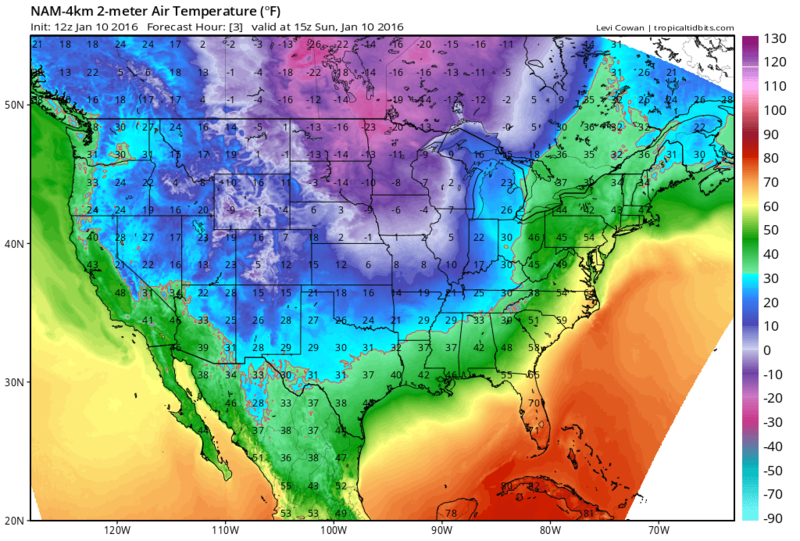 There are parts of the US that are notoriously cold in the winter. Minnesota and North Dakota come to mind. This morning, temperatures in the mid -20s were common across northern MN (NWS). As a strong low churns over the Great Lakes, arctic air is flooding into cities like Fosston, MN (pop. 1,506), which saw a morning low of -34°F today. But how cold can cold get? Temperatures at International Falls, MN fell to -55°F in January 1909. Most recently, the temperature there bottomed out at -46°F in January 2011 (ThreadEx). 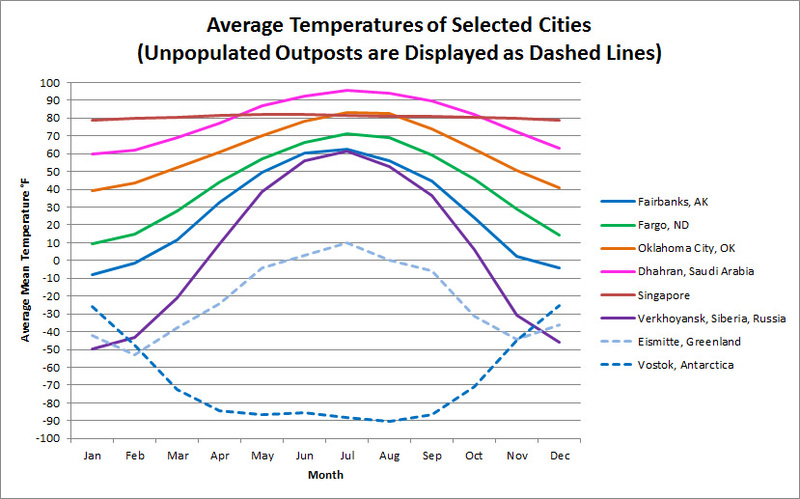 Fosston’s temperature would be considered “warm” for the date at the Northern Pole of Cold, and International Fall’s record lows would be called “seasonable.” Even Alaska does not compete for the title of “Pole of Cold,” instead, possible candidates for the title are a couple of Siberian cities and a weather station in the middle of Greenland’s ice sheet. Of these places, Верхоянск, or Verkhoyansk, Russia (pop. 1,311), is perhaps the most interesting. Verkhoyansk is 1° latitude north of the Arctic Circle, and when the sun sets in mid-December, it stays down for about 13 straight days. As whatever heat remains in this region of Siberia radiates into outer space, the average bottoms out at a vodka-freezing -50°F in January. The temperature sloshes around between insanely cold and absolutely frigid during the winter months as a semi-permanent center high pressure meanders around northeast Siberia. Occasionally, if a low manages to influence the region with southerly flow, record high temperatures of about 10°F occur. This can actually be considered remarkable “warmth” for the season, as it is roughly 55°F above average. This contender for the Northern Pole of Cold doesn’t stand a chance of breaking freezing during the winter months. 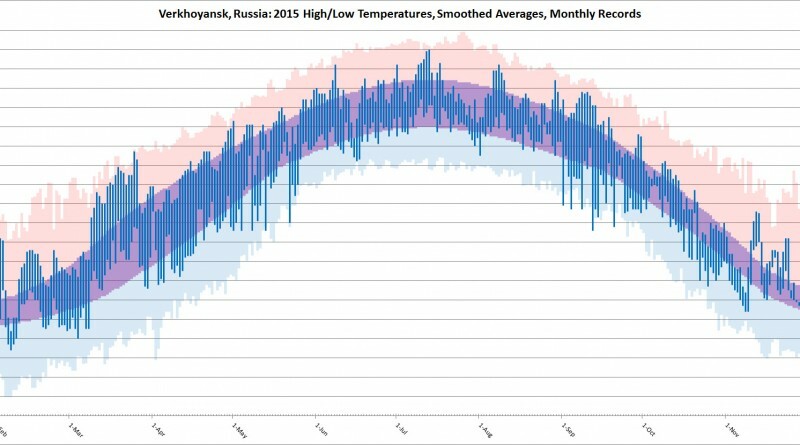 But what makes Verkhoyansk interesting is that temperatures soar in the summer. Most people would reasonably consider the city’s record high temperature of 99°F to be hot; it is 189°F warmer than the city’s record low of -90°F. With an average mean temperature of -50°F in Jaunary and 62°F in July, the city experiences a swing in average temperatures of 112°F! In general, the amplitude of the curve of average temperatures over a year tends to increase with latitude N or S. I suppose this is a fancy of saying that the closer you get to the poles, the more extreme temperature differences between the summer and winter will usually be. You can see an example of this on the chart below. Singapore, located very close to the equator, has a nearly constant average temperature throughout the year, while cities farther north have curves displaying the difference between their summer and winter temperatures. Vostok Station in Antarctica also has an amplified curve, but its orientation mirrors the other locations on the chart because it is located in the southern hemisphere. Based on average temperature, I’d say that Eismitte, Greenland beats out Verkhoyansk for the title of Northern Pole of Cold year-round. Vostok is the Southern Pole of Cold, at least in terms of where ground-measurements are taken.